Any participants age 18 or older (on the day of tryouts), as long as either (i) you have graduated high school, or (ii) the class you would have graduated with has graduated. If you are a player who was born, and resides outside of, the United States or Canada and has never enrolled in a high school, college, or university in the United States or Canada you are considered an “International Player” and ineligible to tryout or be submitted to the league as a Local Tryout Player. Yes, $150 per person online. You can pay by credit/debit card, money order or cashier’s check (made payable to Salt Lake City Stars). All payments are NON-REFUNDABLE. Space permitting, participants who walkup register will be charged $200. Yes, you will need to complete all three registration forms in order to participate in the tryout. They are the Local Player Tryout Registration Form, LPT Release Eligibility Form, and the LPT Medical Consent and Authorization Form. Can I register on the day of the Tryouts? Yes, but space is limited, and early registration is highly encouraged. Participants who register day-of will be charged $200. No, you will need to bring your own meals/snacks. We will have water available during the workouts. Will there be scouts there? 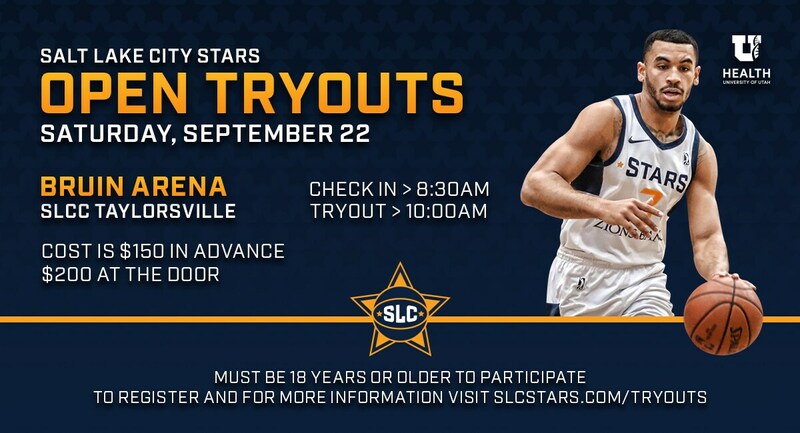 Yes, representatives from the Salt Lake City Stars and Utah Jazz will be in attendance. Once you have completed your on-court commitment, you are free to leave. What happens after the Tryouts? The Stars staff will notify by phone only those players who were selected to receive the NBA G League contracts. What can I bring into the facility? Do I need to bring my own towel, water, etc? The Stars will provide water only. Please bring anything else you need (i.e. towels, ankle brace, extra socks, energy bars, etc.). Will there be trainers or medical personnel onsite in case of injuries? Yes, there will be a trainer and medical services onsite. Do I need an agent to participate? What happens if I sign up and cannot attend? Will my money be refunded? No, the registration fee is NON-REFUNDABLE. Will I be reimbursed for any travel costs? No, there will not be reimbursement for any travel costs. What do I need to bring to check-in? Do I need to bring an ID? You must have a valid photo ID to check in. Will there be any transportation to and from the event? No, you must arrange your own transportation.